If you’re in Washington, DC before January 9, it’s worth stopping by the National Gallery of Art’s East Wing to see the (free!) exhibit Arcimboldo, 1526–1593: Nature and Fantasy. Giuseppe Arcimboldo created some very weird paintings using food and other objects to form portraits. Has to be seen to be believed! I spent most of my viewing time in front of the paintings that used fruits and vegetables, trying to recognize the parts of the whole. Food historians often use paintings (more usually still lifes and scenes of greengrocer shops or kitchens, but Arcimboldo would be a fun break from that) to discover what varieties were available in different cultures and periods. Some of the paintings you can see at the link and in the show include ears of corn, which was a very new vegetable/grain for Europeans in the 16th century. 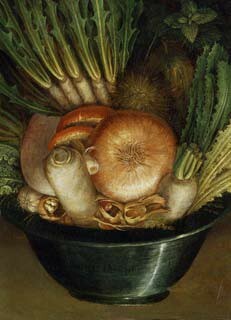 Can you pick out some of the veggies in the painting above? A very intersting painting and tittle! I added the image to my iPhoto library and rotated it. Cool.